Employees from Asheville, NC-based Tupelo Honey Cafe have launched a new online campaign on Coworker.org calling on the company to improve wages. The petition, started by Tupelo Honey employees with support from the Asheville Sustainable Restaurant Workforce (ASRW), states that in the past year, Tupelo Honey has cut back on discounts and food for staff while also reducing wages for support staff by over $3 per hour. Originally support staff made $5.15 an hour, which has now been reduced to $2.13. Petition creator Alia Todd says that cutting wages for support staff has not only made it harder for those workers to make ends meet, but it’s also been difficult for servers to keep customers pleased. As a result, they report that Tupelo Honey has increased the number of servers leading to lower take-home pay for them as well. We are tired of complaining within our location and wishing that the company would change. This wage cut was the last straw and we knew we had to take action. That’s why we started this petition. Right now, Tupelo Honey Cafe is growing at an astounding pace and they have a choice to make: do they want to stand by their original values as a company or do they want to drive down wages of those at the bottom? 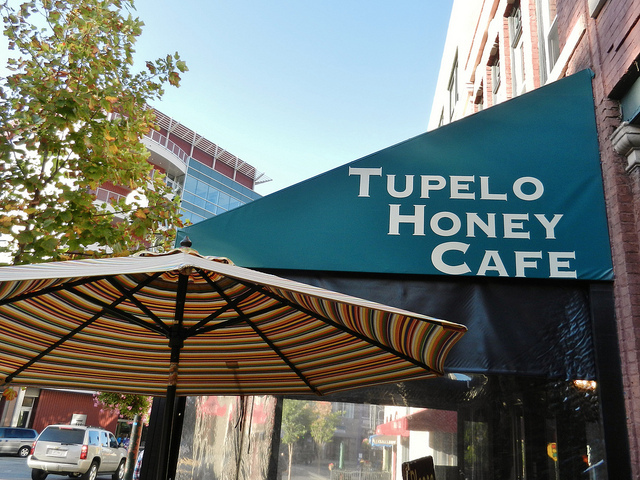 Tupelo Honey Cafe first opened in downtown Asheville, North Carolina in 2000 and now has nine locations across the Southeast with over 800 employees and plans to expand to more states soon.